Nokia make as much profit from super-cheap phones as Lumia flagships! Today it's come to light that Nokia make just as much profit their insanely cheap handsets as they do from their high-end Lumia devices! That's actually really interesting because it means that they are selling so many of their super cheap handsets, like the Nokia 105, pictured above, that their R&D costs on devices like this are not important because of the sheet volumes of these phones which they can sell. Nokia China's platform and technology R&D director, Jun Wang, said that the money which the company makes from shifting a tonne of these devices actually adds up to the profit which the company makes from their high-end Lumia smartphones. Wang was speaking at the launch of the 105 in China, a market which is important to Nokia because of the vast amount of people and the huge growth of the mobile phone market in the area lately. Nokia will have a relatively tough time in the region though; they have to compete with huge swathes of Android devices which sell at tiny prices for a slice of the 60 per cent of mobile phone sales in China which are less than 2000 Yuan (£250 or $385). Nokia is hoping that because they create feature phones with some of the goodies of smartphones that they can tempt people with the tiny £15 price tag that comes with this phone, instead of the slightly higher price which people have to pay for smartphones with touchscreens and faster processors which Android requires. What do you think? Have Nokia got a chance? Should they try to focus more on their Windows Phone business? 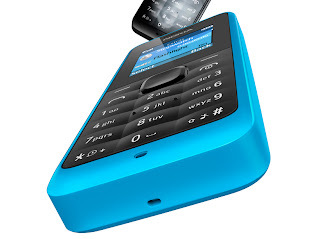 Or would you like to see more in-between phones like the Asha 210? Let us know in the comments below!